Break away from the regular routine of airport shuttle bus services and step up to something you truly deserve. Royal Hawaiian Limousine’s luxury mini-coach services are the perfect alternative to dirty, crowded and uncomfortable mini-coach vehicles that you normally see crowding around the airport. Whether you’re traveling by yourself or with a group of people, Royal Hawaiian Limousine’s luxury mini-coach service provides the right blend of upscale luxury that’s far beyond the typical mini-coach experience. There’s WIFI, plush and comfortable seats, and a professional driver to make your airport transfer a memorable one. 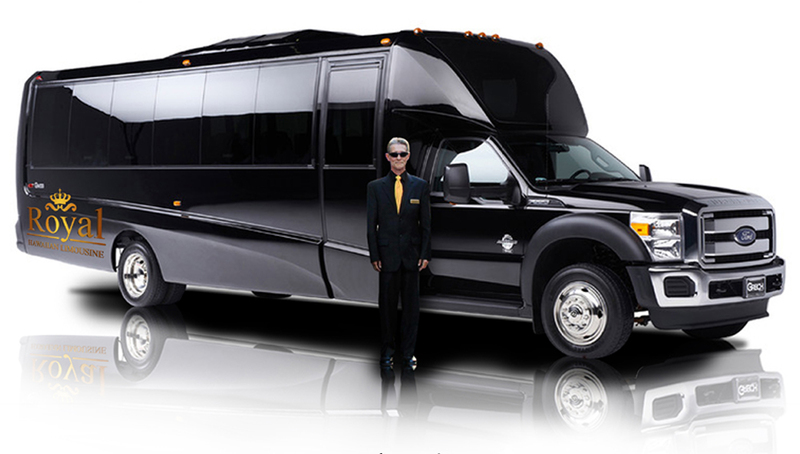 With our luxury mini-coach services, you can get to your destination the quick and hassle-free away, as opposed to taking a shuttle bus, having to cram all your belongings on the overhead baggage rack, and enduring a rather bumpy and uncomfortable ride, not to mention the noise of about 20 or more passengers around you. Our highly trained driver will greet you right at the curbside VIP style, handle your luggage, and take you to your destination safely.